What exactly is “Science Communication” anyway? Communication can come in many different forms, but must always have a goal in mind. 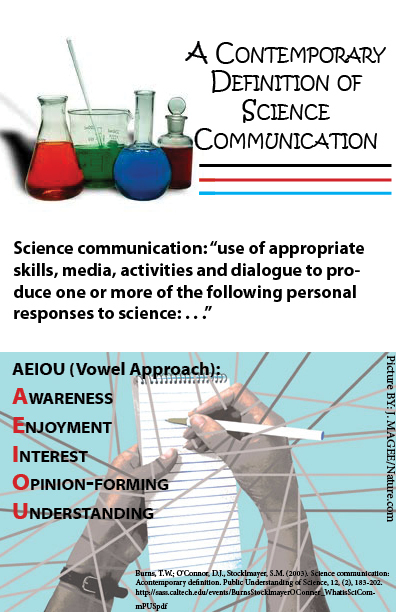 With this definition of science communication, found in the Public Understanding of Science Journal, communicators can better articulate what the point of their articles are. Four years after being diagnosed with lymphoma, a Hialeah teen is honored for his work to help raise awareness and fund research to find cures for blood cancers. When doctors at Joe DiMaggio Children’s Hospital in Broward told CJ George he had cancer, the Hialeah boy didn’t understand.He had only been suffering from back pain. CJ George, 13, the 2012 Southern Florida Chapter of the Leukemia and Lymphoma Society Boy of the Year, and Matthew Sacco, the organization’s man of the year, at Broward Health Medical Center in Fort Lauderdale, Wednesday, July 25. CJ was diagnosed with Lymphoblastic Lymphoma, which is currently in remission. “I was only 9, I didn’t know exactly what I was going through,” said CJ, now 13. CJ is now in remission after undergoing two years of treatment for Stage 3 Acute Lymphoblastic Lymphoma. After seeing children his own age pass away, CJ wanted to help raise awareness and fund research to find cures for blood cancers. This year, CJ was named the 2012 Leukemia and Lymphoma Society Southern Florida Chapter’s Boy of the Year. His sponsor — and the society’s Man of the Year — is Matthew Sacco, president of communications and public affairs for Sunrise Sports and Entertainment, the Florida Panther’s Hockey Club and the BankAtlantic Center . Each year, LLS names a boy and girl of the year with either leukemia or lymphoma blood cancers. LLS also names a Man and Woman of the Year, as part of a 10-week national campaign to raise funding for critical research. Each candidate raises money on their boy or girl’s behalf, and each dollar raised counts as a vote. Sacco won after raising more than $100,000. Together, the 13 candidates raised $378,000.